Larry Cohen may be an enigma to most, but those who grew up in the 1970s and ’80s are bound to have seen at least one film he made or worked on. But for those who have never seen Black Caesar, Q: The Winged Serpent, or The Stuff, have no fear. You will have a crash course on all things Cohen when the acclaimed documentary King Cohen makes its way to Blu-ray on September 25th from La-La Land Entertainment. 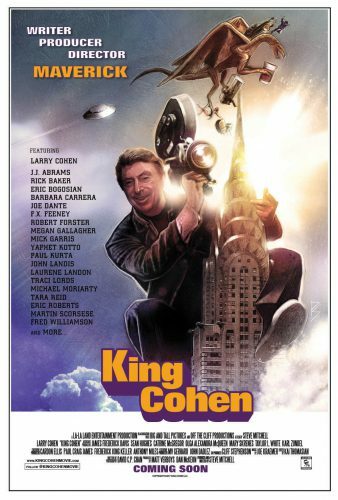 Winner of the 2017 Fantasia Fest Best Documentary Feature Audience Award, King Cohen comes from Steve Mitchell, who co-wrote the cult horror-comedy Chopping Mall. Set to be released as a special limited edition disc/soundtrack combo, fans of the maverick filmmaker will get both the documentary and the film’s soundtrack from composer Joe Kraemer (Mission: Impossible – Rogue Nation. Extra features on the disc are to include deleted interview footage with Larry Cohen and others actors, actresses, and filmmakers. Buckle up for the true story of writer, producer, director, creator and all-around maverick, Larry Cohen (Black Caesar, It’s Alive, Q: The Winged Serpent, The Stuff). Told through compelling live interviews, stills and film/TV clips, the people who helped fulfill his vision, and industry icons such as Martin Scorsese, J.J. Abrams, John Landis, Michael Moriarty, Fred Williamson, Yaphet Kotto and many more, including Larry himself, bring one-of-a-kind insight into the work, process and legacy of a true American film auteur. Few can boast of a career as remarkable or prolific, spanning more than 50 years of entertaining audiences worldwide.